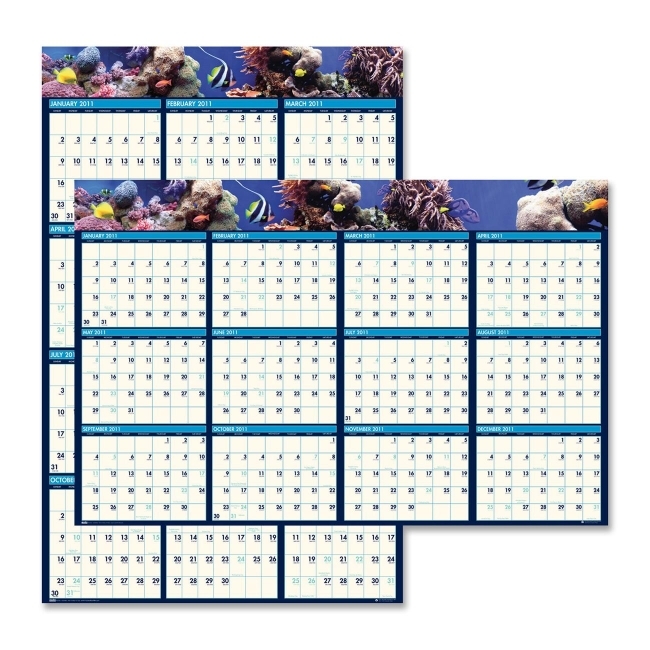 House of Doolittle Planner - 24" x 37"
Block Size: 1.13" x 1.25"
Block Size: 1.25" x 1.13"
Two-sided laminated wall calendar offers a full panoramic undersea photo along the top, write-on/wipe-off surface and 12 months of planning on both sides. One side has a vertical format, and the other side has a horizontal format. Both sides have unruled daily blocks and Julian dates. Daily blocks on the vertical side measure 1-1/8" x 1-1/4", and horizontal side features 1-1/4" x 1-1/8" daily blocks. Planning pages range 12 months from January to December. 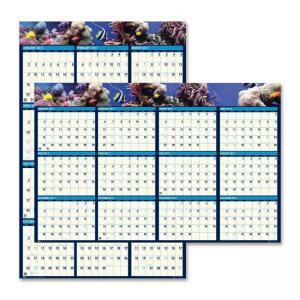 Wall calendar includes self-adhesive hangers and a water-soluble marker. Paper is made with 50 percent post-consumer material.